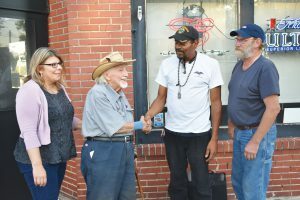 Flanked by Troy residents Kathi and Doug Boley, Korea veteran Richard Johnson shakes the hand of Albert St. Clair after the group dined together at Harry J’s Steakhouse Aug. 8. The Boleys and St. Clair have been raising money to keep Johnson’s home from being foreclosed on. Megan Myers photo. Richard Johnson has never been the type to seek attention. After all, that’s why the 88-year-old Korean War veteran moved to his longtime home in Winfield in the first place. After experiencing a rocky road back to civilian life, the avid nature-lover longed for the peace and quiet of the country. And for the last 32 years, that’s just what he’s found. But now Johnson is finding that peace interrupted. About one year ago, his lending company mysteriously increased the mortgage payments on his home from $506 a month to $860. Johnson, who lives on a fixed income, could not afford to make the larger payments. Then in June, he received a letter stating that if he did not come current on the payments, he would lose his home on Aug. 31. But in the meantime, Boley said that coupled with attorney fees, late fees and interest, the total amount that Johnson will have to pay to stay in his house is around $8,000. So Boley started a GoFundMe account for the cause. In about one week, the account raised more than $2,500, with donations coming from individuals all across the area.Boley also began organizing a team of volunteers to help make necessary repairs and to furnish Johnson’s home with appliances.Many on the team were veterans themselves, including Sheriff John Cottle and Albert St. Clair Sr., an army veteran who runs a charity called St. Clair Hearts Foundation for homeless veterans in the Greater St. Louis area. Guy Kimler, a fellow Patriot Guard rider with Boley’s husband, Doug, donated $250.